Born in 1969, Meru County Mute is an accomplished lawyer, poet and human rights activist who currently serves as a Commissioner of the Kenya National Commission on Human Rights (KNCHR). Being visual impaired has never shaken the lawyer whose area of expertise include governance, constitutionalism, media and disability. He attended Thika High School for the Blind for his secondary education. Mute holds a degree in law from the University of Nairobi and a Master of Law from Warwick University. 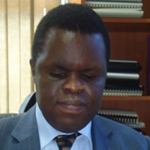 He has served as the Deputy Executive Director of the Centre for Law and Research International (CLARION). He was also among the delegates at the 2004 Draft Constitution of Kenya (“The Bomas Draft”).